Concord, Calif. – The California Community Choice Association (CalCCA) has issued the following statement by Executive Director Beth Vaughan in response to the San Diego City Council voting on February 25 to give Mayor Kevin Faulconer a green light to negotiate the creation of a new joint powers authority (JPA) to implement a regional community choice aggregation (CCA) program. San Diego – California’s second-largest city – is an affiliate member of CalCCA. Under San Diego’s CCA timeline, the city plans to initiate CCA service in 2021. The city council would consider the approval of a JPA agreement in the third quarter of 2019 and submit a CCA implementation plan to the California Public Utilities Commission (CPUC) in the fourth quarter of 2019. Environmental, community, labor, business, and climate and environmental justice organizations supported the resolution approved by the city council. Several cities in the region are currently exploring the feasibility of CCA and have expressed interest in joining the JPA, according to city staff. 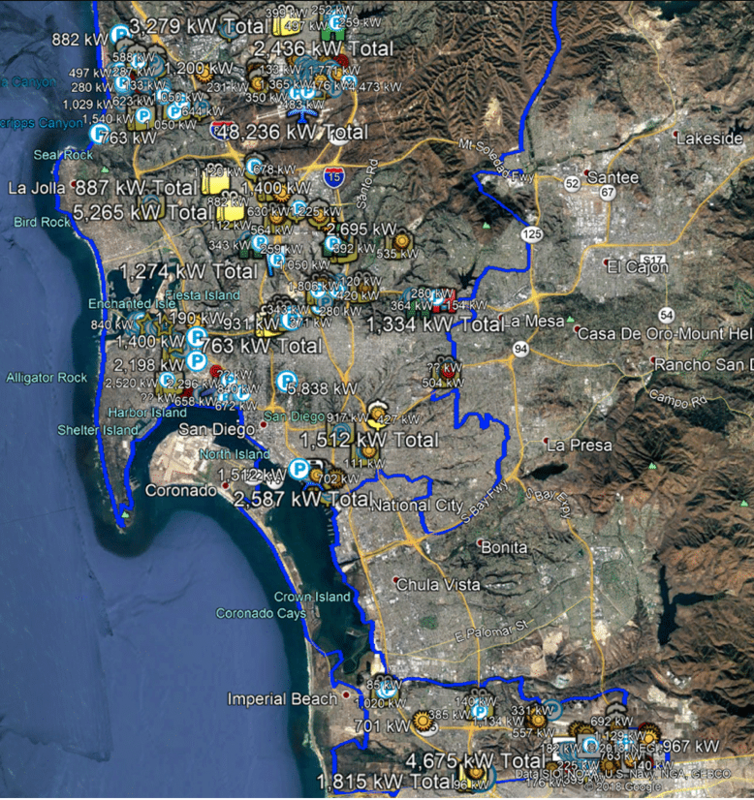 These include Chula Vista, La Mesa, Del Mar, Encinitas, Carlsbad, and Oceanside. Public agencies that may consider joining the JPA or signing on as large customers include the Port, Airport, and County Water Authority. Cities in Orange County that are within SDG&E’s service territory may also have an interest in participating. 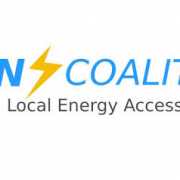 Launched in 2016, the California Community Choice Association represents California’s community choice electricity providers before the state Legislature and at regulatory agencies, advocating for a level playing field and opposing policies that unfairly discriminate against CCAs and their customers. There are currently 19 operational CCA programs in California serving approximately 10 million customers. 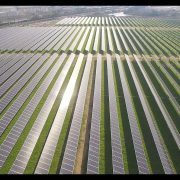 MENLO PARK, CA – The Clean Coalition has released a Solar Siting Survey that highlights the significant level of commercial-scale solar that may be generated within the City of San Diego. The Solar Siting Survey was conducted as part of the U.S. Department of Energy’s National Renewable Energy Laboratory (NREL) Solar Energy Innovation Network (SEIN), a collaborative effort to explore new ways solar energy can improve the affordability, reliability, and resilience of the nation’s electricity grid. The City of San Diego was one of nine teams selected to join the program, with a defined objective to ensure that 25% of the total electricity consumed throughout the City of San Diego is generated by local renewable energy sources sited within the City by 2035, when San Diego intends to be powered by 100% renewables. The San Diego Solar Siting Survey identified approximately 500 megawatts (MWac) of technical solar siting potential for large commercial-scale solar deployments on built environments within the City. 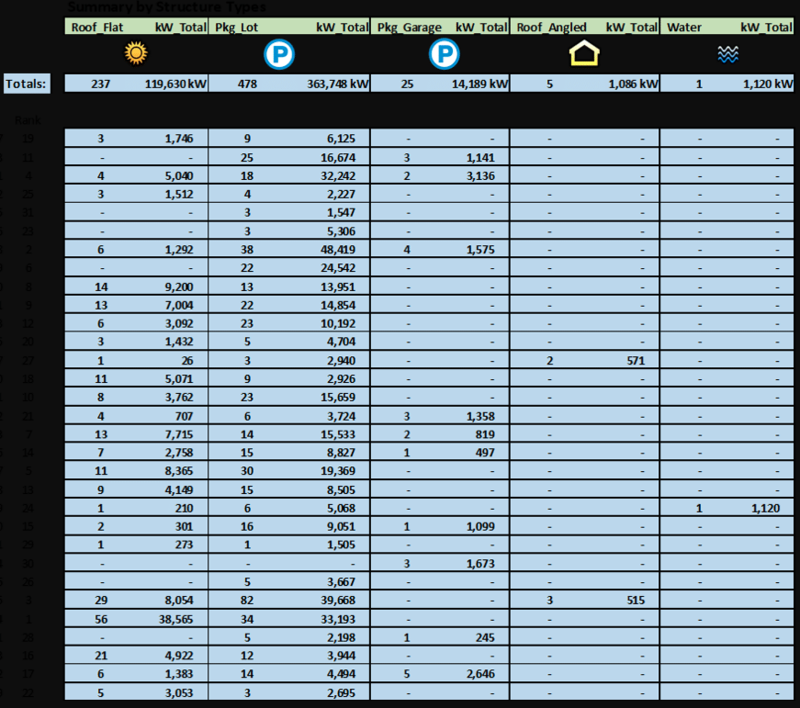 The survey pinpointed the location and estimated project sizing for over 120 prospective solar sites that could each host a solar project of at least 1 MWac. While a portion of the solar siting potential is on large rooftops, more than 75% is on parking lots and parking structures, which are often overlooked as siting opportunities for clean local energy. In total, this survey identified enough local solar capacity to fulfill the average power needs of about 500,000 homes during peak solar production hours. San Diego has even more commercial-scale solar siting potential than was identified in this survey, which focused on very large solar projects. 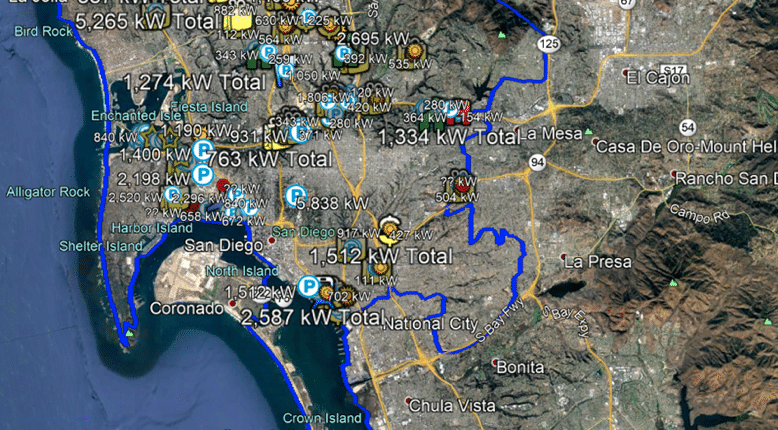 If a minimum project size of 500 kilowatts (kW) were considered, instead of the 1 MW size that was set, the Clean Coalition expects that the technical solar siting potential in San Diego would increase by a factor of two to about 1 gigawatt (GW); this would approximately double again to 2 GW if projects as small as 100 kW were considered. The Clean Coalition’s unique Solar Siting Survey methodology does more than identify viable solar siting opportunities across urban environments; it also evaluates those opportunities based on the interconnection potential of the local grid for each identified site. Solar Siting Surveys help facilitate the development of local solar projects, which San Diego has a tremendous opportunity to expand. With over 100,000 solar installations, mostly at residential-scale, San Diego is already one of the nation’s top solar cities. But as in many U.S. cities, the potential for commercial-scale solar remains largely untapped. 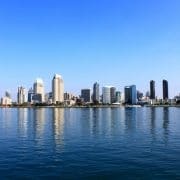 To unlock the potential of this underserved market segment in San Diego, the Clean Coalition will follow this Solar Siting Survey with an innovative Feed-In Tariff (FIT) that streamlines procurement opportunities for commercial-scale renewables and energy storage, greatly fulfilling core City objectives. Developing the local solar projects identified in the Solar Siting Survey can help create a stronger, more resilient grid in San Diego. By pairing distributed solar with other distributed energy resources, such as energy storage, demand response, and electric vehicle charging infrastructure, the city has the potential to establish Community Microgrids, a new approach to designing and operating electricity grids and providing indefinite, renewables-driven backup power to critical facilities. Many of the large solar sites identified in this survey are prime candidates to serve as foundations for Community Microgrid. The Clean Coalition’s San Diego Solar Siting Survey and associated materials are available on the Clean Coalition website. In a dramatic sign of California’s changing energy market, San Diego Gas & Electric wants to stop buying and selling electricity. In recent days, the company has asked lawmakers to introduce legislation that would let SDG&E reduce its role – while also pushing the state to enter the energy market in a big way. The company’s vision could eventually require the state to buy out its long-term power contracts and possibly pay the company for several natural gas-fired power plants it owns. SDG&E is pitching this idea as the company prepares to lose about half of its power customers within the next few years. Last month, San Diego Mayor Kevin Faulconer said he wants to form a “community choice” agency, known as a CCA, to buy and sell power on behalf of the city’s 1.4 million people. Other smaller cities across the county are likely to join that effort, creating an electricity buyer’s club that will compete with SDG&E and leave the company with more power than it can sell. That may sound like it’s bad for business, but it may be more of an opportunity. A well-run utility can make a steady profit from delivering power. SDG&E – one of the region’s largest employers – makes most of its money that way, which is why its bottom line won’t be at much at risk if it stops selling power. The company already gets guaranteed revenue from the sprawling system of power lines and cables it’s built over the last century to each home and business in the region. It also delivers natural gas. Instead, the company is looking to shed the risk it now faces trying to buy power for a customer base that is looking to jump ship. For years, most California power companies did it all – they owned both the power and the lines that delivered it to customers. Now, following years of deregulation and changes in the industry, the state’s three big energy utilities – Southern California Edison, Pacific Gas & Electric and SDG&E – no longer own all of the power they deliver. Much of their power comes from long-term contracts they signed with other companies. Even that market is eroding as governments enter the energy market. SDG&E’s parent company, Sempra Energy, sees that and recently paid just under $9.5 billion to control Texas’ largest utility, Oncor, which only delivers electricity. In the future, SDG&E could look more like Oncor. A draft bill, which Hueso’s office provided, shows what SDG&E is asking lawmakers to consider. The company urges the state to create a way for the company to sell off its long-term power contracts to a “state-level electrical procurement entity.” The first step would be a state-level task force to sort through all the issues involved, which would be many. Matthew Freedman, a staff attorney for The Utility Reform Network, said there are already discussions about the state stepping in to help develop renewable power resources. But those discussions are about developing new power – like geothermal projects in Imperial County – not paying companies for existing contracts. For one thing, it’s not clear what state agency would step up to pay for all of this. One power-buying entity already exists at the state level, a small division within the state Department of Water Resources known as California Energy Resources Scheduling. The division – known as CERS by the few people who know about it – was created in 2001, during the energy crisis, to buy and sell power to avoid rolling blackouts across the state. But in the nearly two decades since the crisis, only a skeleton crew now runs the division, mostly to ensure the state is fully compensated for the power it bought years ago. There’s also the matter of the power plants SDG&E does own – four plants that generate power by burning natural gas. The draft bill would make sure the company is “fully compensated” for those plants in certain scenarios. This could put the state in the awkward position of paying for fossil fuel-fired power even though California lawmakers this year set a goal of having all electricity sold in the state come from renewable resources by 2045. SDG&E said it’s already taking steps to minimize the number of gas-fired power plants it owns. For a while now, it’s been expecting that it would be forced to buy another gas-fired plant from Texas-based energy company Calpine for $280 million. The forced sale is part of a bizarre deal involving former California Public Utilities Commission President Michael Peevey. Helm said SDG&E has worked out a deal with Calpine that would not require SDG&E to buy the plant. SDG&E gets the rest of its power – roughly three-fourths of the electricity it sells – from other sources, largely long-term contracts it signed with wind and solar farms across the southwestern United States and northern Mexico. It cannot make money on the power it buys and then resells from customers. 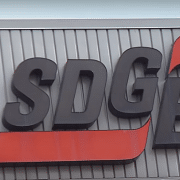 SDG&E Is Looking to Leave the Power-Buying Business, by Ry Rivard, Voice of San Diego, November 19, 2018. Community choice aggregation (CCA) has become quite the hot topic in California. CCAs happen when local governments, either municipalities or counties, form an entity to procure electricity for their communities. In the Golden State they have allowed communities procure renewable energy even more rapidly than the statewide 60% by 2030 mandate. Last week, atop the city’s Alvarado Water Treatment Plant, San Diego Mayor Kevin L. Faulconer (R) announced that the city of 1.4 million would be forming its own CCA. The decision comes as critical action toward’s the city’s Climate Action Plan, which sets an even more ambitious renewable mandate than California’s already-aggressive state one, at 100% by 2035. So, not only is San Diego the largest city in the U.S. to have set an 100% renewable energy mandate, but it is the largest single city in the world to form a CCA. This decision comes just weeks after the California Public Utilities Commission (CPUC) voted to increase the “exit fees” that customers have to pay when opting out of utility procurement and into a CCA. Furthermore, CPUC chair Michael Picker has previously expressed concerns over the implementation of CCAs and their affect on utilities. The raise on exit fees is especially important, as CCAs are already responsible for complying with local capacity requirements and ensuring that remaining utility customers do not see cost increases. However, these concerns do not seem to be an issue in San Diego, as the mayor’s office expects the city to see “a cost reduction of 5 percent or more compared to the utility’s energy generation rates residents and businesses are currently paying,” according to the mayor’s office. Now, with the announcement in the past, comes the process of procuring power for the city of San Diego. Under the proposed CCA’s business plan, a Joint Powers Authority (JPA) would be formed in 2019, along with the appointment of a board of directors. From there on, the board would hire an executive leadership team, a chief executive and a chief financial officer. These executive positions would guide the JPA through the CCA implementation process, in hopes of delivering power to customers by the plan’s target date of 2021. 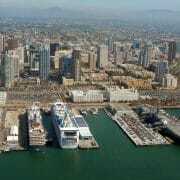 San Diego to form world’s largest single city CCA, by Tim Sylvia, PV Magazine, October 29, 2018. San Diego Failed To Reduce Carbon Footprint In 2017, by Joshua Emerson Smith, The San Diego Union-Tribune, October 27, 2018.